Point Reyes Station today was unusually busy even for a Sunday. The firehouse was the scene of the 27th annual Pancake Breakfast and Benefit for the Point Reyes Station Disaster Council while Toby’s Feed Barn was the scene of the annual Papermill Creek Children’s Corner Carnival and Chef Off. It almost looked like there was a fire at the Point Reyes Station firehouse Sunday morning. All the engines were out on the street, and smoke from a fire-extinguisher demonstration was billowing nearby. Fire engines are moved out of the firehouse every year to give people a place to eat. The breakfast was again organized by Larry Thompson, a county fire department engineer and paramedic. Inverness Volunteer Fire Department helped Marin County firefighters staff the fundraiser. Here Inverness firefighter Burton Eubank serves pancakes and sausages while Inverness VFD Chief Jim Fox flips a pancake. Lynn Axelrod, the Point Reyes Station Disaster Council coordinator, sells raffle tickets at the pancake breakfast. Smokey the Bear gives a thumbs up as sales of raffle tickets and pancakes, along with donations, bring in $9,635 for the Point Reyes Station Disaster Council. A firefighter demonstrates cardiopulmonary resuscitation (CPR) at the entrance to the firehouse. Children got a kick out of being hoisted in a rescue basket operated by a member of the Sheriff’s Search and Rescue Team. Other kids had fun pretending to operate jet boats belonging to the Search and Rescue Team. Youngsters line up for a ride around Point Reyes Station in a fire engine. “Adults can ride too,” one firefighter told me, but I wasn’t about to take up some of the limited seating. Only four blocks from the firehouse, The Papermill Creek Children’s Corner Carnival, a benefit for the preschool, began just before the pancake breakfast ended. Here Carolyn Placente of Point Reyes Station (left), chair of the preschool’s board of directors, handles the cashbox. Her kids, Dylan and Cherise, graduated from the preschool and now attend Inverness School. The Papermill Creek Children’s Corner Carnival offered a variety of attractions, ranging from gourmet food to pony rides to live music to archery from 11 a.m. to 4 p.m. Sunday in front of Toby’s Feed Barn. Six professional chefs from West Marin donated their time and skills for the fundraiser, said food organizer Leslie Durkee. They were: August Temer, the Sand Dollar in Stinson Beach; Shannon Gregory, the Marshall Store; Jennifer Lutrell, The Fork at Point Reyes Farmstead Cheese Company; Matt Elias, Saltwater Oyster Depot in Inverness; Mary Margaret Stewart, the Siren Canteen in Stinson Beach; and Ed Vigil, Perry’s Deli in Inverness Park. Five Brooks Stables in the Olema Valley provided pony rides as part of the fundraiser. At a small petting zoo in the Feed Barn’s parking lot, two calves relax oblivious to a youngster rushing by. With encouragement from Valerie Saenz, who ran the “Eyeball Toss,” youngsters try to get a golf ball to land in a vaguely skull-shaped target made of plastic cups. Inside Toby’s, numerous little girls were eager to have their faces painted. Kids tested their archery skills under the guidance of Richard Saenz of San Quentin. Richard is an instructor in the prison machine shop and also does contract work for NASA. Without question, the physically largest attraction for kids inside the Feed Barn was a maze formed from bales of hay. It took some of the youngsters awhile to find their way out of the maze, and because of all the activities in town, it took some of their parents awhile to find their way out of Point Reyes Station. Nor was Point Reyes Station the only West Marin town who chose to have some civic fun on Sunday. While all this was going on in Point Reyes Station, down the road in Bolinas, a Health and Safety Day — complete with helicopter demonstrations, firetruck rides, and fire-extinguisher training — was scheduled from 11 a.m. to 3 p.m. at the firehouse and Community Health Center. When I was a lad in the 1940s, the fictional character who fascinated me was not Superman, Roy Rogers, or the Lone Ranger. It was Mowgli. Of course it’s easy to romanticize living naked with a pack of wolves, but one of Mowgli’s adventures in particular remains part of my life. Mind you I’m not talking about the Mowgli of Walt Disney’s animated movie The Jungle Book. That trivialized portrayal of the youth would not come along for another 20 years. I’m talking about Mowgli, the hero of nine Rudyard Kipling short stories. My mother read me at least three of the stories from Kipling’s 1893 collection, The Jungle Book, and I was more intrigued by what Mowgli got to see than by what he actually did. Kipling (1865-1936), a British short-story writer who won a Nobel Prize for Literature in 1907, made a name for himself in two disparate genres: 1) children’s stories; and 2) stories and poems about British imperialism in India. The Jungle Book, naturally, is set in an Indian jungle. Mowgli’s greatest accomplishment is to kill a malicious tiger, Shere Khan. With help from two wolves, he causes water buffalo at two ends of a ravine to stampede down it. Shere Khan gets caught in the middle and is trampled. Monkeys in the abandoned city of Cold Lairs sit around its crumbling palace. For me, the highpoint of the stories occurred when a pack of monkeys kidnapped Mowgli and took him to the Cold Lairs, an abandoned city complete with a palace half overgrown with jungle. Mowgli escaped when Kaa, the python, hypnotized the monkeys with a writhing “hunger dance,” but that wasn’t what intrigued me. What I, as a young boy, found hardest to imagine was a jungle so aggressively overgrowing grand buildings from past cultures that the buildings ultimately disappear. When my mother assured me that large structures really can get lost in tropical forests, I began to fantasize about finding one. It was only when I finally made it to such places as Guatemala, Thailand, and Burma in the 1980s that I saw for myself how readily jungle vines, bushes, and even trees can take root on abandoned edifices such as temples, palaces, and government buildings. Vines and other foliage taking over an abandoned commercial building in downtown Rangoon create a romantic sadness. It may be exotic, but it’s hard not to feel sentimental when seeing former grandeur being consumed by opportunistic plants. I’ve carried my fascination with intrusive jungle life with me for many years. The area around my desk in the old Point Reyes Light newsroom in the Creamery Building was filled with laurentii and dieffenbachia while pots of philodendrons and spider plants hung from the rafters. As it happened, the California Newspaper Publishers Association (CNPA) in 2004 named The Light first in Public Service statewide for a series of stories about a Guatemalan immigrant who was attacked in Bolinas and nearly died. His personal tragedy was a catastrophe for his family. His wife was very ill, and he had been supporting her and the rest of his family, who were living in rural poverty in a remote area of Guatemala. My love of the jungle is most evident these days inside Mitchell cabin. Here and there spider plants cascade down from the loft into the living room and dining room below. Screened from the dining room by a floor-to-ceiling tower of spider-plants, Lynn prepares dinner in our kitchen. If you don’t look where you’re going in the dining room, it’s easy to find greenery in your face. Lynn and I have pretty much learned to avoid becoming entangled, but guests are forever brushing spider plants out of their hair. Having spider plants hanging into the living room from the floor above often results in our peering through a bit of jungle while carrying on a conversation. What’s more, it only takes a little jungle to make everything seem more exotic. I may have moved into the village, but deep inside me the romanticism of Mowgli in the Cold Lairs palace lives on. Little did I realize four years ago when I wrote a posting about Scotland’s ill-fated attempt to establish a colony in Panama that I was telling the backstory to last month’s referendum on Scottish independence. On Sept. 19, Scots voted 55.3 percent to 44.7 percent to remain in Great Britain and not become an independent country. Given most coverage in the US press, readers could have easily missed the fact that Scotland had previously been independent, but when a nationwide get-rich-quick scheme went awry, it lost its independence. I’m going to let a Scottish journalist, whom I met this summer, describe the significance of the vote against independence. First, however, here’s an excerpt from my Sept. 14, 2010, posting that gave the backstory. Scotland was an independent kingdom from 843 when it was unified until 1707 when it became part of the Kingdom of Great Britain. As an independent country, Scotland during the 1600s had imperialistic ambitions in the Americas. It tried unsuccessfully to establish colonies in Nova Scotia, East New Jersey, and South Carolina, but the worst disaster occurred in Central America. In the late 1690s, the Scots attempted to establish the colony of New Caledonia on the Isthmus of Panama. A series of crop failures had caused Scotland to look for an overseas source of income. Enter financier William Paterson with a scheme for establishing a colony at Darien in Panama. It would be a way to facilitate trade with the Far East and with European colonies on the west coast of the Americas. The site of the Darien colony is shown just to the left of the word “Darien” in the “Gulf of Darien” on the right side of this map from 1699. Despite no one really knowing how all this could be done, the Company of Scotland was chartered in 1695 to raise money to finance the scheme. The company’s first expedition to Panama in 1698, however, ended in disaster. About 1,200 colonists sailed for Panama, but because of disease and starvation, only about 300 survived. Of the five ships that had made the crossing, only one was able to return to Scotland the following year. Unfortunately, a second expedition had unwittingly set sail before the remnants of the first arrived home. The second group tried to rebuild what the first group had abandoned, as well as complete a fort for defense against the Spanish. And the Spanish did indeed attack. The Scots were briefly able to hold them off but were ultimately forced to surrender. By then, most of the colonists who had joined the expedition had died of dysentery or other diseases. Only a few hundred (out of about 1,300) made it back to Scotland. The economic effect of these failures devastated Scotland. Citizens from all levels of Scottish society had invested in the Darien scheme, and estimates of their combined losses range from a fifth to nearly a half of all the wealth of Scotland at that time. Many Scots were left indebted and impoverished. Desperate to recover — in large part by sharing in England’s international trade — the Scots agreed to the 1707 Acts of Union, which created Great Britain as a political union of England and Scotland. 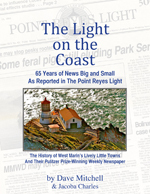 While in Durango, I had the honor of receiving ISWNE’s Eugene Cervi award for career achievement and also gave a talk based my new book, The Light on the Coast: 65 Years of News Big and Small as Reported in The Point Reyes Light. Lynn and I met scores of editors from throughout the English-speaking world. Among the foreign journalists we met was Scott Reid of Scotland (above center). Interestingly, he works for a pair of sister newspapers that took opposing positions in their endorsements regarding Scottish independence. In the wake of the referendum’s defeat, Reid has given his fellow ISWNE members a copy of his observations to share. For more than two years, those of us working in Scottish journalism have been privileged to have a front row seat as history was made in our country. The nation faced a simple question – Should Scotland be an independent country? The answer wasn’t so simple. And the tale of how Scotland, a nation of five million people, at one point looked on the verge of making a decision that would send shockwaves around the world will be talked about for decades to come. To say the Scottish people were transfixed by the prospect of independence from the outset would be to lie, frankly. Scott Reid, who wrote these observations, (right). The Scottish National Party (SNP), which has campaigned for independence for Scotland from the U.K. for many decades, won a landslide majority in the Scottish Parliament in 2011 because it had governed well for the previous term, rather than due to any great interest in this particular policy. An agreement with Westminster was made for a referendum to be held. And most people, while appreciating the historic nature of this, got on with their lives. In the months leading up to the vote, the atmosphere changed. In May, a paper I work for, the Sunday Herald, backed a Yes vote. This was no overnight switch – the tone of the paper had been moving in that direction for some time. The response was incredible. Sales rocketed and continued to fly as the weeks went on. In one recent week after the referendum sales of the paper year-on-year actually doubled to 49,291. After two television debates between Alex Salmond of the SNP and former U.K. chancellor Alistair Darling of the No camp – one which was broadcast around the world and even picked up by C-Span – huge viewing figures showed that the public was now on-board with this process. After the second debate, won by Salmond, the No campaign had a wobbly period. The polls narrowed. There was something in the air. I increasingly wondered if change was afoot. Then a poll showed Yes ahead. 51% to 49%. And all hell broke loose. The markets shook, there was talk of both the U.K. Prime Minister and the U.K. leader of the opposition having to resign if they lost the vote, the issue dominated the front pages of papers in Scotland and throughout the U.K., and clearly had an impact beyond. In response, the Prime Minister, Deputy Prime Minister and leader of the opposition charged up to Scotland to try to retrieve the situation and offer Scots more powers for the Scottish Parliament. Throughout the final weeks, our papers were dominated by the referendum. On a daily basis The Herald contained 10 full broadsheet pages on the topic, featuring news, columnists, and occasionally four pages full of letters. The Sunday Herald, which had declared its position early doors, was also dominated by the topic. Counter to its Sunday sister paper, The Herald decided to back the No side a few days before the vote after Westminster leaders promised extra powers for the Scottish Parliament. However, it warned that if much enhanced extra powers for the Scottish Parliament promised were not delivered then another referendum should follow suit, and the No side would deserve to lose. It was an articulate case and one that even met with approval from many of those on the Yes side. Both papers have different editors and were given free reign by their owners to come to their own conclusions. After such a build-up, referendum results day itself was a bit of an anti-climax. Soon after polls closed at 10 p.m. it became brutally clear this wasn’t going to be a nail biter. The head of polling company YouGov pointed to new figures suggesting No would win and said he was 99% certain the survey was accurate. As much as there were doubts over the polls for much of the campaign, for someone to put his neck on the line that far told its own story. Then from the minute the first result came in and Clackmannanshire was the centre of the world’s attention, it was obvious. That area was designated by many as a guaranteed Yes vote – it went the other way. We set to work putting out several editions throughout the night, culminating in an 8 a.m. special edition, our work being rewarded by huge sales increases throughout that week well ahead of the Scottish market. In the end, the result came in as 55% No, 45% Yes. So was there any point? Well, yes. It opened up a debate about who we are and what kind of country we want. It engaged almost the entire population in politics. It proved that, when people know every single vote counts and it’s an issue they really care about, they will come out in numbers. It allowed voting for 16 year olds and 17 year olds, which proved to be such a success I suspect it will be carried over to regular Scottish Parliament elections. And it has worked in Scotland’s interests, as it has made it clear that this little country in the north of the U.K. cannot be taken for granted. Sparsely Sage and Timely is powered by	WordPress 4.9.10 and delivered to you in 0.790 seconds using 51 queries.